Pulang Maleta Collective | In the beginning there was shame. Now there is baggage. Weigh it. Tag it. Lose it. Claim it. A local web-tv entertainment site did an interview with the entire cast of “Baggage”. It was definitely an unusual experience for the entire company. Take a look! We’re thrilled to say that audiences and critics alike are loving “Baggage”. Only 3 shows left. Buy your tickets in advance at www.fringetoronto.com or call 416-966-1062. Or buy tickets at the door, but come early! Categories: Uncategorized . 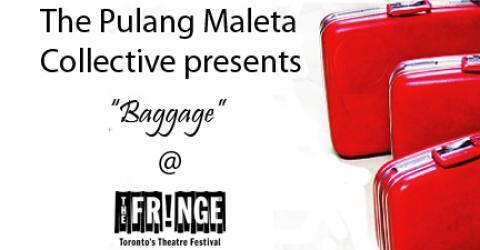 Tags: baggage, critics, filipino theatre, reviews, tickets . Author: reesebaguio . Comments: Comments Off on Buzz Building for Baggage! Playing to a full house last night, it was amazing for the Pulang Maleta Collective to wake up to more good news this morning. Check out Jon Kaplan’s review of Baggage in Now magazine. Thank you to the Fringe Audience! Congratulations to the Cast and Crew of Baggage!